Hua Daodao, a deputy editor in the Huanqiu Shibao‘s commentary department, has written a piece offering useful insights into how the Australian media’s latest exposés of CCP overseas political activities looks from within China. Being a good patriot, Hua summarily brushes aside all the allegations (which incidentally i tend to think are more an indictment of Australian complacency than anything else) but the article seems to have struck a chord with many politically-engaged Chinese young people, being passed around quite widely on WeChat. Specifically, he complains about the labels “nationalist” and “ultranationalist” being used in previous Australian coverage of his public activities and works. Given the prominence of various kinds of enemies of China in Lei’s work, i think it’s fair to call him a “nationalist.” But “ultranationalist” isn’t accurate, as there are many far more extreme, even outright militaristic, participants in Chinese national identity and foreign policy discourse. In fact, last year in the wake of the unfavourable South China Sea arbitration result, when the government made clear that it did not want street protests or KFC boycotts, Lei worked to discredit this type of nationalist action as anti-China false-flag troublemaking. What Lei really is, openly and proudly, is a pro-CCP ideological warrior, who views China as beset by foreign plots to infiltrate its government and manipulate public opinion — a near-perfect mirror image of what the CCP and its “agents” now stand accused of in Australia. This grim irony will presumably pass unnoticed by nationalists on all sides of the ideological war. In lieu of normal posts (working hard to wrap up my thesis) i’m going to try taking this blog back to where it began, sharing some of the quick summary translations i do for my own purposes. They’ll be mainly Chinese media and commentary that hasn’t been reported in English. I’ll let the pieces speak for themselves, but i’d love to hear any readers’ thoughts and analysis. 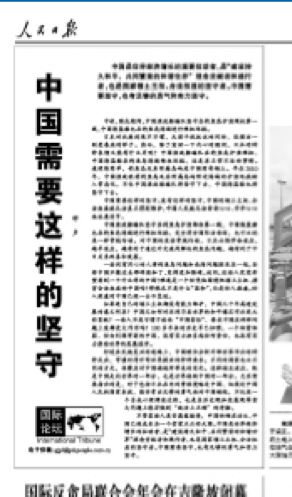 The first is an op-ed from the Huanqiu Shibao on Sunday (June 12), regarding events at the Shangri-la Dialogue. Most of the article addresses US Defense Secretary Carter’s reiteration of his “Great Wall of self-isolation” line, but it also raises the strong statements on the South China Sea issue from the French Defense Minister. The latter appears to have been the basis for the striking headline, which propelled the story to the top of the agenda over at Sina and Baidu on Sunday, and onto front pages elsewhere online. Widely reposted (under the “Eight-Nation Army” headline) – top headline on Baidu News, Sina News, front page on HQW, QQ, etc. By Liu Zhixun, fellow of the Renmin University Chongyang Financial Research Institute. Liu frames the story as a series of “thankyous” to Ashton Carter for using his Great Wall analogy at Shangri-la, because, first of all, the Great Wall is evidence of China’s thousands of years of purely defensive strategy. Liu says China should also thank Carter for showing its young people the US’s true “bandit logic” and “hoodlum behaviour”, thereby disabusing them of any unhelpful admiration they might have had for America. Liu concludes by stating that other western countries have been “talking nonsense 妄言” about sending ships to the South China Sea. “Some experts have made preliminary calculations that a new “Eight-Nation Alliance” may emerge in the South China Sea. If this situation really does appear, it will carry enormous warning to the world and China: people will not forget the great powers’ invasions of China in the 19th century, and the harm they caused China. If this history is repeated, Carter will be remembered in history as an inglorious character. But Liu finishes by noting that there is “reason to believe” China and America have the ability to prevent the occurrence of a destructive conflict. 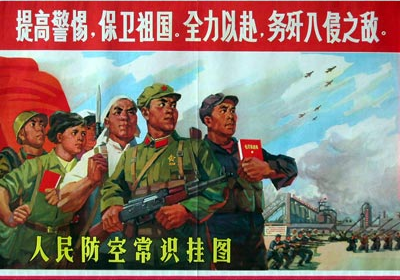 Increase vigilance: the reasonable conclusion of PLA pundits like Dai Xu? The April 20 edition of the Huanqiu Shibao (Global Times) carried an article by recently-retired PLA Lieutenant-General Wang Hongguang, directly criticizing the Chinese media’s hawkish military commentators. In recent years, military affairs experts have frequently appeared on TV and in all kinds of publications, with the positive effect of strengthening the masses’ national defense awareness and arousing patriotism, but it cannot be denied that some have said off-key things, things that have misled the audience and been irresponsible. Lt-Gen Wang, who now serves as Vice President of the PLA’s Academy of Military Science, made it quite clear that by “military affairs experts” he was referring to fellow PLA academics, particularly Zhang Zhaozhong, Luo Yuan, and of course Dai Xu. Some experts have inappropriately made comparisons of China and Japan’s military strength, claiming “China and Japan will inevitably go to war”, and that this “would not significantly affect our period of strategic opportunity”, [thus] inciting public sentiment and causing some interference with our high-level policy decision-making and deployments. 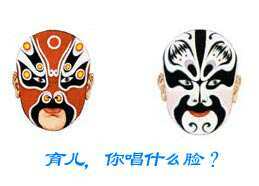 Wang Hongguang is in a position to know. Until recently he was Deputy Commander of the PLA’s Nanjing Military Region. 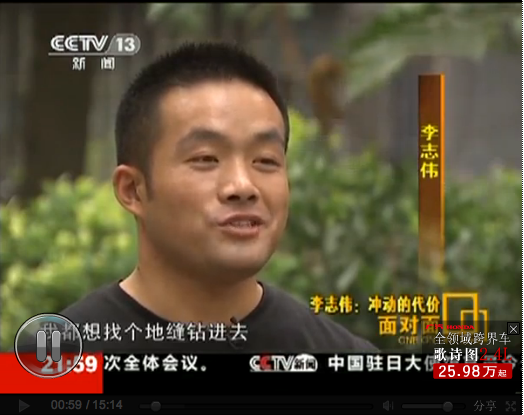 How does an average Chinese migrant worker become a “nationalist” rioter? How does a normal migrant worker who doesn’t even know the national anthem suddenly become a nationalist rioter? One of the great things about the Chinese media is how they are willing and able to interview suspects under arrest, or in this case out on bail, to get some direct commentary on their own actions. Henan migrant worker Li Zhiwei was one of the 20 most-wanted from the violent anti-Japanese protests in Shenzhen on September 16. According to his interview with CCTV, and the extraordinary China Youth Daily story that follows, he was the first to surrender. …’Forcing others to hate Japan carries a dangerous logic‘, published on a page 2 of the October 23 CYD, which brought together most of the above to defend the Shanghai tourists and forcefully attack anti-Japanese nationalism, going so far as to equate China’s “extreme anti-Japanese figures” with Japanese right wingers. The headline even sounds like a veiled attack on the patriotic education system that does so much to demonize Japan. As a case study in the nature of “nationalist” violence in China, Li’s story really speaks for itself, but for the benefit of those who don’t have time to read it start-to-finish, in the translation below i have bolded what i found to be the crucial sections.